As a subscriber to the SPE Industry Update, you will periodically receive messages from our sponsors. You may unsubscribe from future sponsor emails by clicking here. SIGMA Plastic Services' customer, Kalypso Ultra Technologies, was confronted with the challenge of developing a motor mounting part, made from PA 6,6 with 30% glass fiber reinforcement. The part had a 4" diameter, with large thickness and geometry variations, and the narrow tolerances around each diameter were +0.003"/-0.00". Kalypso faced a number of issues in developing this part: the behavior of the material being used was difficult to predict due to the crystallization and the fibers, so 'normal' design rules did not apply; the geometry was exceptionally complex, so prior experience with similar shapes was limited; and the part had to be created within the extremely close tolerances. Furthermore, optimized gating and reliable thermal control were critical for the success of this project. Faced with the option of using 'trial and error', multiple iterations and the possibility of mold rework that would have taken time and result in missing the delivery date, or using simulation to run a virtual project, Kalypso decided to use SIGMASOFT®. Kalypso performed a thermal analysis of the mold and the tempering system, simulating 20 production cycles under exactly the same parameters as in reality and using conventional cooling for the part. 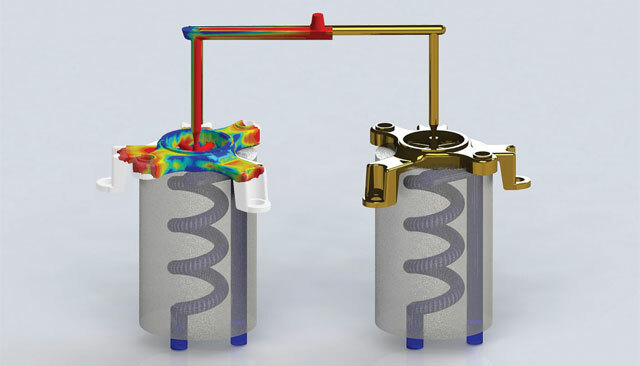 The simulation showed that the temperature distribution of the mold indicated that the cores were a potential tooling hotspot. "With each cycle, the (temperature) delta became more significant," stated Shawn Schnee, CEO of Kalypso Ultra Technologies. These hot spots would have an undesirable effect over the thermal stresses responsible for warpage and as well as negatively affect part quality. An expert in the use of conformal cooling via DMLS (Direct Metal Laser Sintering) and 3D printing in America, Schnee is committed to taking mold manufacturing and scientific process engineering to a completely new level. He decided to address the issue using an innovative approach: SIGMASOFT® was used to simulate conformal cooling in the center core. The virtual molding technology of SIGMASOFT® has opened a completely new way to analyze the melt flow and the mold component interactions. SIGMASOFT® is able to simulate the complete injection molding process, including all mold components with their physical properties over multiple molding cycles, just as on the production floor. This faithful reproduction of real-life processing allows an unmatched insight, avoids costly mistakes and minimizes failure risk. The selection of thermal components was guided by a complete analysis of the thermal dynamics, based on the physical design and characteristics of each processing component. According to Schnee's experience, "If we don't consider all variables, it will lead to costly mistakes and inaccurate assumptions." After running the simulation, the results show equalizing temperature distribution as well as a reduction in the cycle time. Based on the SIGMASOFT® results, the set-up sheets were then formulated. By using SIGMASOFT, Kalypso was not only able to deliver the part to the customer on time, but they were able to communicate with the customer about the issues they discovered, their proposed changes, and the results they found. "SIGMASOFT® provided reliable data that helped our company optimize runner balancing, water placement and water strategy - using conformal cooling instead of traditional cooling methods," stated Schnee. "We had successful first shots with minimal tool tweaking on the actual molding machine." Kalypso Ultra Technologies is a new company, created as a full-service engineering provider, developing plastic devices and molds for thermoplastic injection molding and specialized processes such as LSR, metal injection and micro-injection molding. Kalypso differentiates itself from other engineering service providers through their practice of delivering accurate set-up sheets, photorealistic models, 3D printed components and full motion simulation. "This way we can provide a transparent view of the entire process," state Shawn Schnee, CEO. As a visual/ communication aid, Kalypso provides a motion simulation detailing how the mold will fit and function in a machine and what pecentage of shot-size, platen space and injection presure will be required for each application. SIGMASOFT® Virtual Molding is a revolutionary technology, able to virtually reproduce the injection molding process in its every detail. Now you can understand beforehand whether or not a concept will work and, most importantly, why. Are you facing a challenging mold or process? Contact us and we'll show you how SIGMASOFT® can help you conquer even your hardest challenges.